First off, when looking at some of the artwork here from the numerous artists Im in complete awe. The question i have is probably stupid but what is a "graver"? Is it a metal punch just with a different name? Ive dabbled in metal engraving but usually with just simple items i could find on hand. From simple chisels on sheet metal to using a miniature flathead screwdriver(something you would prolly use on eye glasses) on a .50 cal casing. Crude, yes I know, but working a design into metal seems to keep calling me back for more. And i was hoping maybe someone in the forum could link me to a better tool. i think i made the grade!!!! Hi Solz, This type of engraving is removing metal rather than a punch that displaces metal. 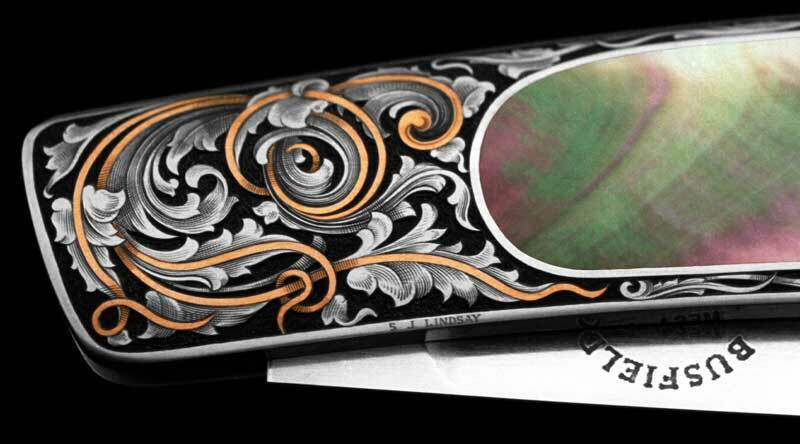 Hand Engraving can be described as the process in which a hardened, shaped, and sharpened piece of steel, called a 'Graver', is pushed through the metal's surface. This is done with one of three methods: by hand pressure (push graver), with a small lightweight hammer and chisel (graver), or with a pneumatic air-driven hammer. 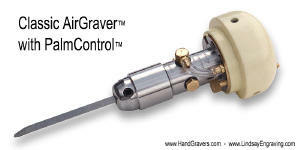 Pneumatic AirGravers emulate both the hammer and chisel and the push-graver technique. 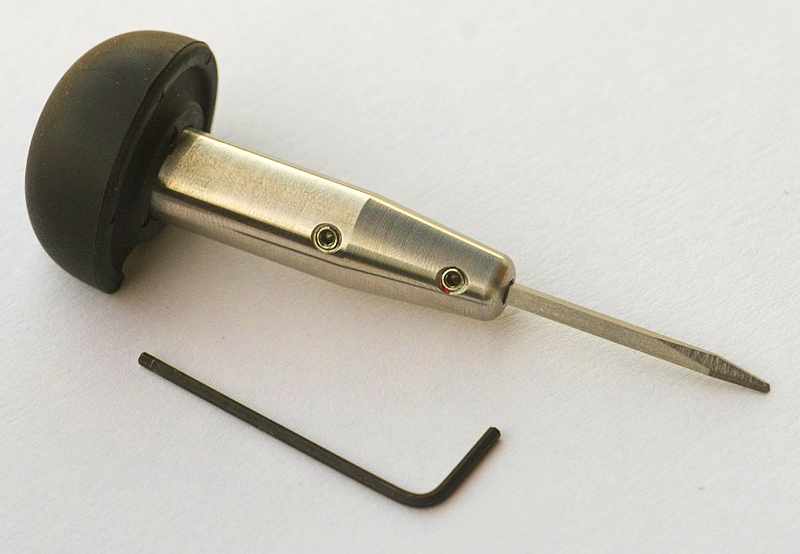 The graver is ground to a pointed shape adhering to very specific angles. These angles allow the graver to properly enter the metal surface and travel forward, continuously curling the metal directly in front of the graver face, while leaving behind a small furrow. Cassie could you do a post and upload that video for every one to view please. I know once I get started on this I'm going to be in it for the long run as I am very art minded and can draw,tattoo 3 hand with ease,Can basicly draw or tattoo what I can see but have problems keeping the vision in my mind but hey,thats were the internet helps ay. Would like it if some one or some of you could post up some designs (forgive me if there is already a section on them). Love the site and you can be sure to see me here a lot once I get started,Thought about the rotary engravers but there rubbish,I'm needing hammer type like the ones you make ste but there a bit out of my price range for a while which is why I am looking towards electric or push type,don't think I could do the hammering the chisel way but hey every one has to learn and practice. Take care and do the best you can. Hi Rick, Yes, no problem shipping to the UK. And also here is page with videos of fundamental practice cuts. First let me say thank you for all the information that you've put out and for how helpful you've been to all of us new to this art. I've gotten the template and have a sharpened graver and handle. I've been practicing straight lines and I've been struck with a point of curiosity. I have watched the videos and I was wondering what magnification they are shot at? I think I've having a crisis of scale in that I'm trying to cut lines that are as deep and wide as they appear on my screen, but I'm not achieving much success with anything wider than .5mm (if even that wide). So I'm wondering if I'm simply trying to go too deep/wide for a hand pushed graver. What would be a reasonable expepectation of depth/width of cut for the universal 116 point being hand pushed? The lines are nowhere near as big as they look under magnification. A common beginner mistake is to try to cut too deep - and it's especially hard when you're hand pushing. If you need the line deeper, just go over it again. But remember, those fine shading lines you see in the pictures / videos? They're as fine (or finer) than a hair. Thanks for the pointers. On the subject of point damage, aside from cuts becoming appreciably more difficult and slips happening (more frequently) what are indications that a tip is dull or broken that I can look for before a slip or some other catastrophe that would ruin what I'm working on? 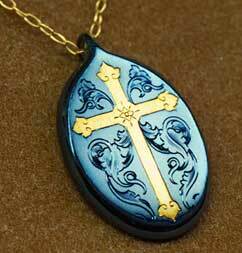 Can you elaborate a bit more on howto use copper for engraving? Thank you for your prompt response. Copper is used to engrave on. 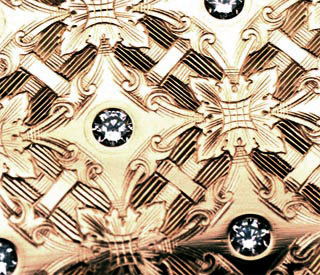 It's a softer metal than steel and quite a bit less expensive than gold or silver. 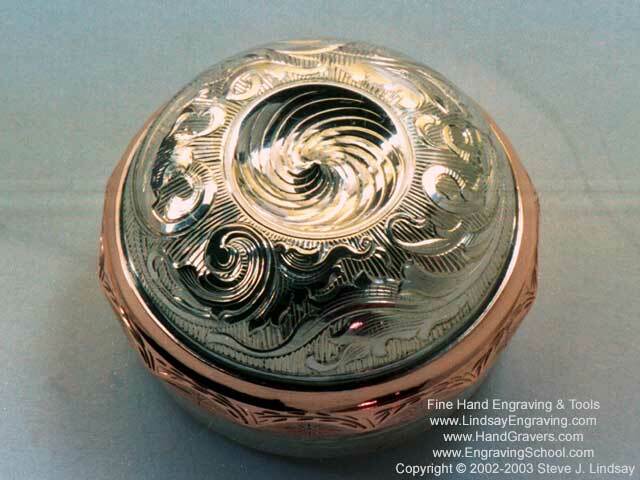 Many people use it to practice, and some people engrave copper for a finished product. before i got a block, i used a piece of plywood screwed to a1.5" dowel... makinga sort of T out of the whole thing. shelaced my engraving project to the ply, and butted the dowel against my bench pin.. this way i was able to fairly easily turn my curves..
course this would outlive it's usefullness when you started to get out of jeelry scale. We've worked out this Engraving School Starter Set with Neil Hartliep. 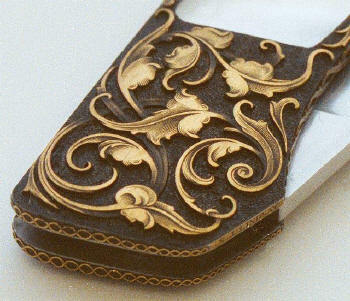 It's designed to exactly fill the needs of the beginning engraver. 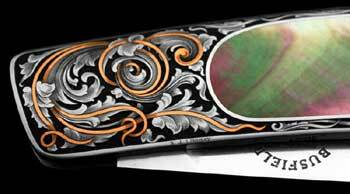 With the lessons from Neil's book, The Basics Of Firearms Engraving (included in the kit) and these tools, you will get started off on the right foot. Does this look like a good starter kit or would I be better off going with something else. Steve has something compatible, chisel handle, push graver, and sharpening set. Look at the tools page a ways down, add some blanks and maybe a template and you are set to get started. Probably at a more lucrative price since you get a sharpening solution with it. Found it and I think you're right. My Police discount through Brownells would make their Hartleip kit about $60.00 cheaper than the Kit that Steve has for $272.50 (Chisel holder, Manual push graver and Lindsay Sharpener set), but I think the kit of Steve's would probably be better in the long run.....plus after reading posts on this forum and seeing how Steve is so willing to give help I think I'd like to buy from him....I'll just have to save up my pennies for a little longer. The Brownell's kit has nothing included for sharpening and that is one of the most important elements. Having gravers and no way to sharpen them is like buying a gun and no ammunition. The late Neil Hartleip's book is a useful beginner manual that shows how to manually sharpen gravers on a stone. This method is very difficult for most people to master especially if you do not have an instructor at hand to correct your mistakes. All of us who learned engraving more than 30 years ago had to manually sharpen on a stone but later I changed to the powerhone, diamond laps, and sharpening fixture. about a year ago I got the Lindsay sharpening system with several templates and now hardly ever use the power hone. For a beginner, the universal or detail template and a flat graver template will be all you will need for a long time the rest of the templates are fine for advanced techniques but a beginner does not need them. Good luck to you. I also was in law enforcement when I started engraving. templates are the ticket.. just got a bunch more. is there any reason to get the round graver template? I currently am of limited means and mobility. Is is possible to purchase some of these items used? I wanted to get the kit that's about $190 but it is a bit too steep right now to see if I have an aptitude for this? I would appreciate a pointer to where I can purchase these hand items. Also If you have some blems I would be interested. 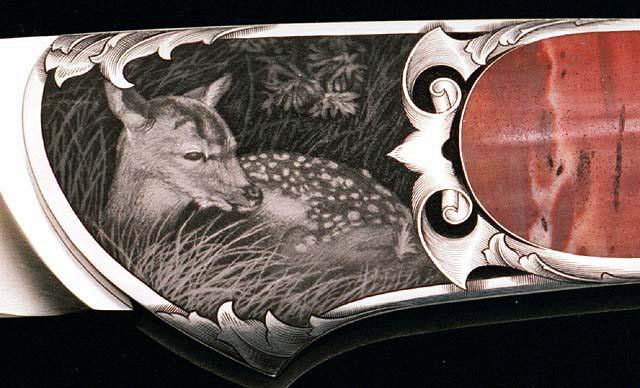 I was considering gunsmithing (not necessarily the fabrication, but the understanding, operation, maintenance, and modification of existing firearms) but a friend recommended engraving (gun engraving specifically) and through a series of hops and jumps across Google search results, I've found this wonderful forum. But the reason I'm making this post is I'm having difficulty trying to find a good starting point. The wealth of information on this trade is overwhelming and between bit sizes, shapes, materials, methods, and techniques I have no idea where to even begin. Peter M mentioned a user named Steve having a good starting 'kit' for aspiring engravers but I haven't been able to find it. So long as it's under $400, I can reasonably afford it. 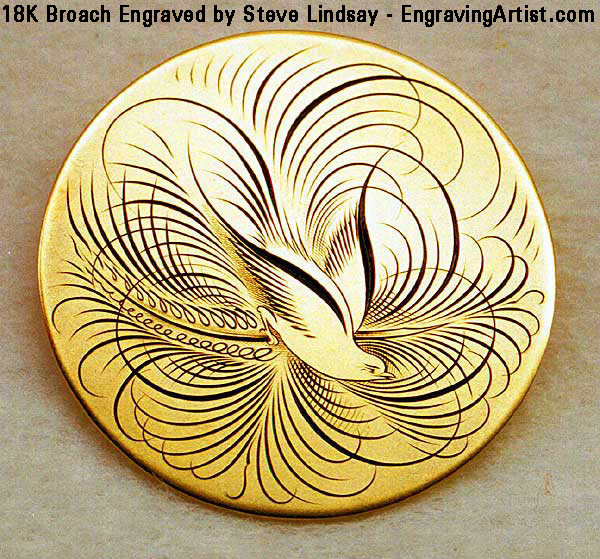 It's nice to be here and I think this place has a wealth of information for novice and expert engravers a like. I hope to hear back from you guys soon! Look trough the forum there is a lot of good information on how to get started. 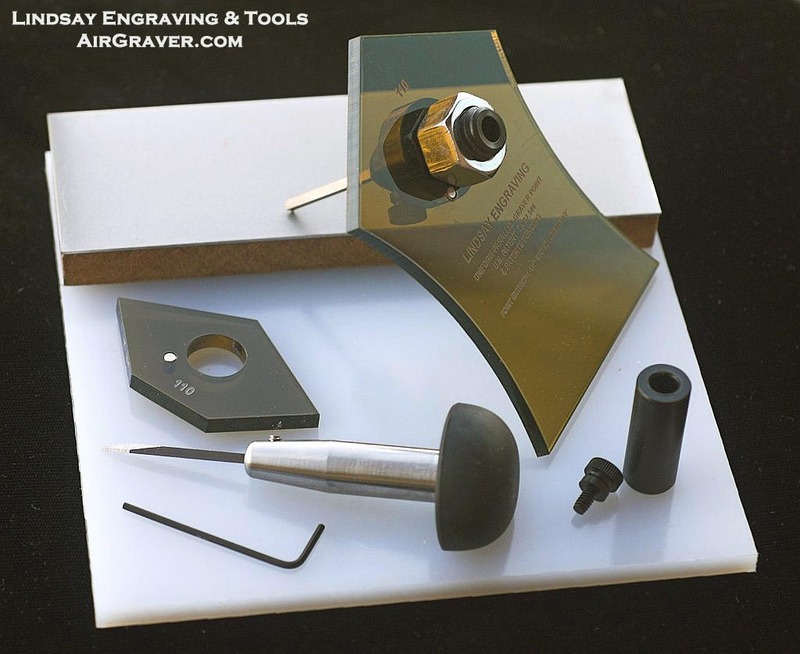 Steve's kit I mentioned earlier can be found here http://airgraver.com/Hand_Engraving_...Graver%20Tools . As a forum owner, myself, I should have known to check here, first. I just sent you a PM, Steve. I want to get a couple of those gravers, the template and sharpening system for those and also the chisel and hand push graver. I've got some old tools and have done more than a little struggling and know part of that is because as good as I am at sharpening knives, I'm not worth a damn at sharpening gravers. I should probably state that most of what I have been trying to engrave has been annealed high carbon steel, which probably compounds matters a bit, but I have to assume a push graver will work fine with steel since I've had very limited success with it even with dull tools, poor technique and an overabundance of ignorance about engraving. So could you point me to the items I would need to put together a very simple manual startup kit that includes the ability to resharpen the gravers properly? I'm thinking pre-sharpened gravers would be just the thing because then I'll know what they SHOULD cut like and will then know when I've got it wrong. Hi Robert, I just found your post on the forum about ordering the gravers. Did you receive the order ok and how are you getting along? Got everything OK and am going to be talking to you about better outfitting myself. I've talked to enough people and researched all the options to the point where I'm satisfied which equipment to go with and just need to talk to you about details. hello everyone, this is my 1st post. wow theres a bunch of great information here on how to get started. I'll try to put it to good use. I dont know if this will help but I make my own hand tools from materials that are sometimes free. A good example arethe dovetail chisels and hand gravers Ive made from worn out HSS (high speed steel)thicknesser blades. Ill post pics when I get home to the city. First visit a saw doctor or sharpening service and beg damaged or worn out thicknesser/buzzer blades from them. It always helps to carry a couple of bottles of beer in with you. The blades come in a variety of thicknesses but I usually get the 3mm (1/8") or 4mm (3/16") in 312mm-500mm lengths (12" - 15"). They can be 25mm (1") across so lots of chisels and gravers can be cut from one blade. To cut to a close size use a thin (one of them 1.5mm ones) cutting disk in the hand held angle grinder and place the blade on a wet cloth to reduce overheating of the HSS. Yes I know HSS is very tolerant of overheating but why take the risk. I usually cut onto a concrete slab so my bench doesnt get damaged. Run the disk down the line youve marked to start a nice accurate cut, it doesnt have to be deep just very straight. The thin disk will want to follow that line now. Keep the cloth wet and cut away from yourself. Sparks will be kept to a minimum and cutting is slow but the result should be a pretty clean edge. Dont try to cut half way and snap, HSS doesnt like it and will show it's displeasure by breaking where it chooses not where you want. Plus some HSS acts like glass when it breaks. Diamond stones are the best for sharpening HSS but any good stone will work too. The bevelled edge is the perfect start to a dovetail chisel all thats needed is a bevel on the other side a handle. (I use 16mm x 65mm titanium bolts but any bolt will do) just drill a hole and Devcon the blade in and Bobs your uncle. Cut square lengths and all you need to do is clean up, cut to length and use one of Steve's most excellent sharpening jigs to grind the tip. 3 disks and one length of free HSS gives up to 16 graver blanks. I am close to retirement and looking for a new way to pass some time and make a little extra cash in the process. I currently do glass etching and some wood carving.I've been using a rotary tool to dress up knife handles and thought I would like to give hand engraving a try. My first question to you and the forum would be, is this something that can be picked up by self teaching? I enjoy a challenge and I am not afraid to fail. I have been looking at your website for quite awhile and it is something that I can't get away from. Looking forward to more conversation on this subject. Thanks for all the info here.I am ready to give this a try,maybe someday I will be able to do something worthy of showing here..
Wow... impressive work! I'm extremely interested in trying my hand to see what I got. As a tattoo artist I have always had an appreciation for old-world crafts and trades, as well as the artwork and patterns. I use a lot of the lattice and filigree and calligraphy styles in my artwork already. My question, apologies if it's already been answered, is where would one look to buy these tools locally? as far as the cheap way to get started (times are rough for everyone lately), could these simple tools be purchased in a hobby shop or ACE hardware or will I be better off purchasing online? I wish I could spend 200-300 for the basic start-up kits but right now this just isn't an option. also, is there anyplace online where I could search for used tools? I looked around on ebay but didn't really see much of anything there. Thank to Steve and all the other members for the great resource here! One of my favorite aspects of the interwebs is how simple it has become to learn new things. I've already spent a few hours scrolling through photos and tutorials etc... the gears are already turning! OK I got my Lindsay Carbalt blanks and sharpening templates a couple of weeks ago and Ive been spending an hour every night after work chisling away at a practice plate (16 Ga) glued to a 1/2" piece of timber. I use the gravers I made from HSS now as kata-kiri bori style chisel points and Im having fun. I hope to sort the transfer of drawing to metal soon and start with some proper shapes. Cheers Steve for the forum and for sharing your expertise. Hi Mason, Sorry to take so long to reply. I just now saw your post. UK is no problem. In the shopping cart just select the country, type in your postal code and the shopping cart will give several shipping options. There are manual tools on the site. I'll try and paste that part of the page below. I hope this works. Manual Palm-Push stainless graver, wrench with Lindsay sharpener.